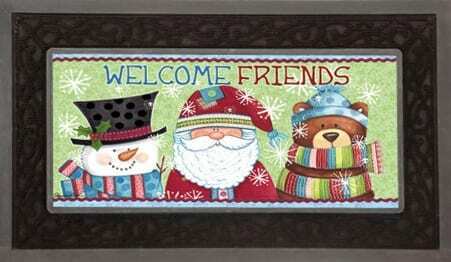 Welcome friends to your home this holiday season with this “Welcome Friends” mat that features Santa, Frosty and a teddy bear all bundled up and ready for the cold weather. This seasonal, switchable insert is made for placement in Evergreen’s Rubber Switch Doormat Frame. This insert is made of rubber and features a heat-sublimated design. This Christmas-themed mat features Santa Claus with his traditional phrase, “Ho, Ho, Ho” along the bottom, replacing the “O”s with peppermint candies. This seasonal, switchable insert is made for placement in Evergreen’s Rubber Switch Doormat Frame. Insert is made of rubber and features a heat-sublimated design.